In The Works is presented on the 3rd Sunday of each month and features three composers or composer teams, each presenting about 20 minutes of new material. This month features the works of composers: A.J. 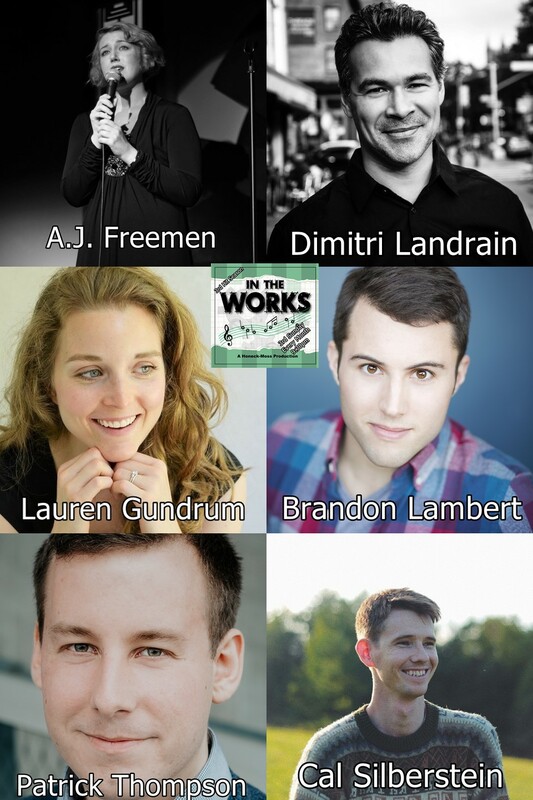 Freeman & Dimitri Landrain, Lauren Gundrum & Brandon Lambert, and Patrick Thompson and Cal Silberstein. Hosted by: Thomas Honeck. A. J. Freeman is a writer, director, and performer originally from Los Angeles, now based in New York. She has worked for over 12 years in educational theatre, directing dozens of full scale productions, and running her own literacy-based musical theatre program for low income students. Though this nonprofit, The Troupe, thousands of children in schools across Los Angeles received free reading books. The Troupe’s free musical theatre workshops and assemblies inspired students from all backgrounds to use their gifts and talents through visual and performing arts. She is also a cabaret performer, championing brilliant but forgotten music of the 1920s and 30s, and is a lyricist in the BMI Lehman Engel Musical Theatre Workshop and at The 92Y. Dimitri Landrain is an NYC-based composer and pianist from Paris, France. His work has been featured in Tony Award winner William Finn’s “Songs By Ridiculously Talented Composers” series and on French Top 50 artist Liane Foley’s platinum album “Entre Nous.” Dimitri holds a BM from Berklee College of Music, an MM in Jazz Performance from The University of Cincinnati, and an MFA from the NYU/Tisch Graduate Musical Theatre Writing Program. He works extensively as a pianist and has released a solo piano album titled “September, NYC” which is available on Spotify, iTunes, etc. Dimitri is currently attending the BMI Lehman Engel Musical Theatre Workshop. Patrick Thompson and Cal Silberstein are a writing team based in NYC. They met at the NYU Graduate Musical Theatre Writing Program where they wrote their first musical, A POSTCARD FROM CONEY ISLAND. Thompson is originally from Milwaukee, WI where he worked as a music director and resident artist for the KidsWrites program with Skylight Music Theatre. His musical, PASSING BY, premiered in the 2015 Chicago and New York Musical Theatre Festivals and his most recent show NOBODY KNOWS premiered at First Stage Children’s Theatre this past summer. Silberstein hails from Perth, Australia where he is a founding partner of the independent theatre company, Ludicrous Displays. His other musicals, VIVA LA RESTORATION, HOW WE RUINED MACARTHUR’S MARKERS, FAIRYBREAD and STRAWMAN have had productions across Australia. His short opera, PRESIDENT JOAN (OR THE UNEXPECTED VIRTUE OF SANDWICHES) recently premiered as part of “The Dinner Party Operas” at the Brooklyn Museum. They are continuing to workshop A POSTCARD FROM CONEY ISLAND and are writing a series of stand-alone cabaret songs.